RGB Monday is a meme I stared to share photos that comprises and highlights the colors of Red, Green and Blue either in a photo or three different photos where the colors are connected in either ways. The series completes a year by July and it was received nicely by the fellow bloggers and this meme along with the other ones keeps me active in blogging. A bright color always capture our attention easily and I have many photos shot during my travels and I find these memes helps in sharing them. Thanks for the support. 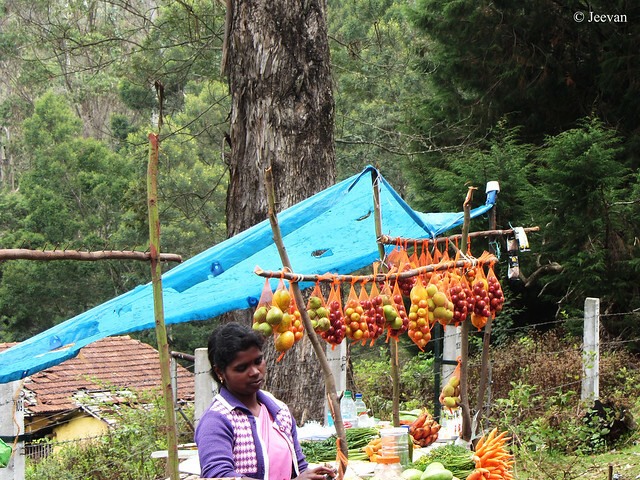 The above one was shot at Kodaikanal, during my vacation, where a woman vendor selling fruits from a temporary fruit stall on the observatory road and the fruits sold are grown from the small farms across the mountains. They sell plums, pears, peaches, butter fruit and other related fruits, including delicious carrots. Reminds me of stalls I have seen in India. There is definitely a charm to these vendors and stalls. I don't know how it is now, but back in the day, the vendors sold vegetables and fruits that were local. They might have even grown themselves. I wonder how it is these days. Nice find and share, Jeevan! That's a great idea .I have never been to kodaikanal ooty. Have few friends there . They buy me those flowers which doesn't dry n chocolates . I like fresh carrots offered at such places. I recently ate it and it was nice. Nice pic, btw. These are beautiful colors, and I'll bet the fruit is delicious. YUM... Bet those fresh fruits and veggies are delicious... Great colors, Jeevan. So beautiful and vibrant, Jeevan. Great picture. Beautiful colours! Love the fruits of the hill stations! the fruits are so fresh and delicious. no wonder dieticians always say "eat local"
Careful click,Jeevan.You have absorbed the details. Great shot,looks so refreshing to see such a view. That blue canopy is a good choice of color as it makes me think it is a product that I will want to see. I love this photo of hanging fruits. A good picture tells a thousand words.